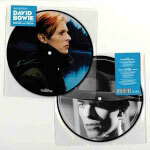 The next DAVID BOWIE 40th Anniversary 7 inch picture disc single is to be released next month. • Royal Mail will issue a set of 10 Special Stamps as a tribute to one of the most influential music and cultural figures of all time. 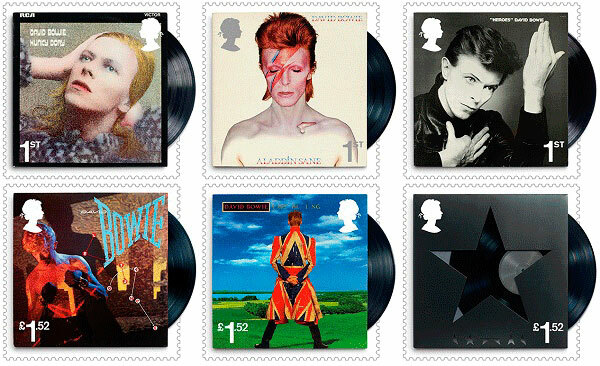 • Six stamps will feature images of the album covers: Hunky Dory; Aladdin Sane; "Heroes"; Let's Dance; Earthling and ★. • Completing the set, four additional stamps will show Bowie performing live on tours across four decades: The Ziggy Stardust Tour, 1972; The Stage Tour, 1978; The Serious Moonlight Tour, 1983; and A Reality Tour, 2003/2004. • The stamps will be on sale from 14th March at royalmail.com/davidbowie and from 7,000 Post Office branches across the UK and by calling 03457 641 641. ROYAL MAIL today revealed it will issue a set of 10 Special Stamps to honour DAVID BOWIE - one of the most influential music and cultural figures of all time. The stamps and a range of limited edition souvenirs are available to pre-order from today at royalmail.com/davidbowie and will be on sale from 14th March. Bowie's 1972 album cover for The Rise and Fall of Ziggy Stardust and The Spiders From Mars was featured in the Classic Album Covers stamp set issued in January 2010. Hunky Dory, Bowie's fourth album and released in December 1971. Time magazine chose it as part of their '100 best albums of all time' list in January 2010. "Heroes", his twelfth studio album and released in October 1977. This was the second instalment of his "Trilogy" recorded with Brian Eno and Tony Visconti. The title track remains one of Bowie's best known and acclaimed songs. Let's Dance, his fifteenth studio album and released in April 1983. Co-produced by Nile Rodgers, and featuring three of his most successful singles Let's Dance, Modern Love and China Girl. Let's Dance is Bowie's best-selling album. ★, Bowie's 28th and final studio album, released on his 69th birthday - 8th January 2016 - and charting at No.1 in more than 20 countries. Bowie died two days after the release of ★, the album reaffirming his legacy as modern music's most unrelenting innovator and topping critics' 'Best of 2016' lists. The Stage Tour, 1978. Also known as Isolar II - The 1978 World Tour and The Low/"Heroes" World Tour because it was staged to promote the Low and "Heroes" albums. A Reality Tour, 2003/2004. Staged to promote the Reality album this tour was to be Bowie's last tour. Philip Parker, Royal Mail stamp Strategy manager, said: "For five decades David Bowie was at the forefront of contemporary culture, and has influenced successive generations of musicians, artists, designers and writers. Royal Mail's stamp issue celebrates this unique figure and some of his many celebrated personas." Presented in association with CineEvents, the nationwide screenings of both films will take place across the UK on 7th March. Participating cinemas include: Picturehouse, Everyman, Curzon, ODEON, Cineworld and Vue cinemas as well as a number of independent sites and chains. In the United Kingdom, ★ ends the year as the sixth biggest selling album, with total chart sales amounting to 410,000. ★ was the fastest-selling album of 2016, achieving 146,168 chart sales in its first week of release. The Best Of Bowie greatest hits is placed at #10 with 328,500 chart sales across all formats, while his Nothing Has Changed compilation ranks at #40. 08. Seer - 20 Jahre-Nur Das Beste! 04. Lil Kleine - Wop! 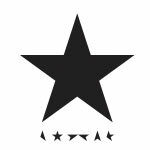 View the latest worldwide charts and end of year positions for the Blackstar album page that is continually updated. Tickets are on sale now for a WOODY WOODMANSEY talk and signing in Leeds. This event hosted by CRASH RECORDS takes place on Sunday 5th February at Headrow House, Leeds from 6pm - 8pm. Dave Simpson who did such a great job hosting the evening Crash Records had with Ken Scott last year will once again be conducting the interview. When the talk has finished Woody will be happy to sign books for those attending the event. Please choose the collect at venue option for this event. If you opt for ticket plus book, your book will be given to you on arrival. Those who choose ticket only will be on the door collect list. If you already have a copy of the book you are welcome to bring it with you for Woody to sign. Tickets are priced at £23.99 for book and ticket, and £5 ticket only. For more details, information and tickets visit crashrecords.co.uk website. TIN MACHINE are caught cutting up behind the scenes of a rehearsal for their performance on Dutch TV's Countdown in October 1991. They joke around and run through 'You Belong In Rock 'N' Roll', with David doing a Marc Bolan impression, and 'One Shot' as well as a solo snippet of 'Goodbye Mr. Ed' with Bowie on acoustic guitar. In the United Global World 'End of the Year' album chart for 2016, DAVID BOWIE's ★ album was the SIXTH biggest-selling album in the world, with sales of 1,984,000 copies. His second biggest selling album for 2016 was Best Of Bowie with 686,000 copies, the thirty-fifth biggest worldside seller. 01. Adele - 25 (4,668,000 copies). 02. Beyonce - Lemonade (2,674,000 copies). 03. Drake - Views (2,650,000 copies). 04. Justin Bieber - Purpose (2,327,000 copies). 05. Coldplay - A Head Full Of Dreams (2,182,000 copies). 06. David Bowie - ★ (1,984,000 copies). 07. Twenty One Pilots - Blurryface (1,745,000 copies). 08. Metallica - Hardwired... To Self-Destruct (1,490,000 copies). 09. Rihanna - Anti (1,459,000 copies). 10. Sia - This Is Acting (1,337,000 copies). 35. David Bowie - Best Of Bowie (686,000 copies). Media Traffic gathers and publishes the weekly global music charts for albums and tracks. These hitlists based on the official charts from many countries around the world. ★ end of year positions include: Australia #8, Austria #6, Belgium (F) #3, Belgium (W) #9, Denmark #17, Netherlands #7, New Zealand #6, Poland #40, Switzerland #6, United Kingdom #6, USA #64. Check out the 'garden version' of the DAVID BOWIE advertisement for the Japanese sake Jun Rock Japan CM advertising campaign in July 1980. The show takes place on 22nd February at The O2 in London and will be broadcast live on ITV. • On this day, 40 years ago, DAVID BOWIE released his Low album. Incorrectly known as the first of the "Berlin Trilogy" it was recorded in France at Chateau d'Herouville studios, located in the Val d'Oise département near Paris. 'New Music: Night And Day' was the original title and initial RCA Canadian cassette tapes made it onto the market with that title printed and dated with December 1976 on the tape before quickly being pulled. • On this day, 43 years ago, DAVID BOWIE was photographed by Kate Simon at Olympic Studios, 117 Church Road, Barnes, West London SW13 9HL in 1974. On this particular day, he records 'Rock N' Roll With Me', 'Candidate' and 'Big Brother'. • On this day, 51 years ago, 'Can't Help Thinking About Me' was the first solo release from DAVID BOWIE after changing his stage name back in September 1965. Released on the Pye label (Pye 7N 17020) it was backed by 'And I Say To Myself', both tracks produced by Tony Hatch. • On this day, 52 years ago, DAVIE JONES & The Manish Boys audition for Rocky River Promotions at the London Palladium for possible bookings at the Star-Club in Hamburg, West Germany. Unfortunately, they don't receive an offer to perform there. The DAVID BOWIE 'Legacy' compilation 2-LP Vinyl album has gone straight in at number one in UK Official Vinyl Album Chart. 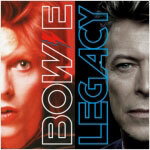 Legacy hits its highest chart position so far at #5, Blackstar climbs up to #30, re-entries for The Next Day #69, Hunky Dory #71 and The Rise and Fall of Ziggy Stardust and The Spiders From Mars #76. Legacy also achieves its highest positions this week in Scotland #4 and #7 in Ireland. On the anniversary of DAVID BOWIE's passing BBC RADIO 6 MUSIC celebrated his life with various programmes. The outstanding highlight as far as I'm concerned without doubt was the MARC RILEY show. Marc had David's childhood friend, backing singer, dancer and travelling companion GEOFF MacCORMACK on the show and there was a special Q&A with Spider From Mars drummer WOODY WOODMANSEY. The show closed with a repeat broadcast of the last ever radio interview David gave (coincidentally to Marc Riley) in 2004 a few weeks before his last ever tour came to an untimely end. If you missed the show you can catch listen in HERE via the BBC iPlayer. 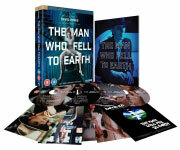 Directed by pioneering rock film-maker D.A. Pennebaker, this documentary and concert film captures DAVID BOWIE and his band, The Spiders From Mars, performing at London's Hammersmith Odeon on 3rd July 1973. It was at this now-infamous concert that Bowie made the announcement, shocking fans and media alike. Rather than marking his withdrawal from music, his declaration signalled the retirement of the Ziggy Stardust persona, and the end of a hugely influential chapter in Bowie's own story. In addition to the concert movie, the evening will include a new film produced by MOJO magazine exclusively for these screenings. 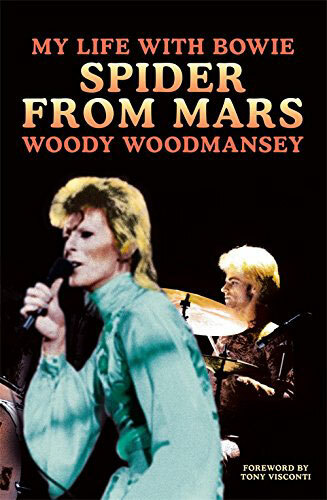 This film will feature MOJO's Editor-In-Chief Phil Alexander in conversation with The Spiders From Mars drummer Woody Woodmansey, whose own acclaimed memoir, My Life With Bowie: Spider From Mars, has just been published by Sidgwick and Jackson. As well as re-living that fateful night in 1973, Woody will provide further insight into what he describes as "the adventure of a lifetime". Reminder: Tonight at 22.00 BBC RADIO 2 is the DAVID BOWIE documentary Exploring Life On Mars? 'Life On Mars?' is one of David Bowie's most astonishing songs, prompting some observers to describe it as Bowie's own 'My Way'. The irony is, it very nearly was: in 1968, Bowie wrote an early lyric (Even A Fool Learns To Love) to French singer Claude Francois' 'Comme D'Habitude' which was rejected - Paul Anka's lyrics weren't and the song eventually became Sinatra's 'My Way'. Three years later when 'Life On Mars?' was released on the Hunky Dory album 'Inspired by Frankie' is written in David Bowie's handwriting on the back cover. We tell the story of how the song came about and we learn what it was like working in the studio with Bowie. Bowie described it as being 'a young girl's reaction to the media'; the lyrics best described as being 'painting-like', impressionistic. Contemporary singer/songwriter Marc Almond examines the lyrics and uncovers the origins of inspiration for the song. We speak to Sophia Anne Caruso, the 15-year-old actor who worked with Bowie on his musical Lazarus and is now singing 'Life On Mars?' in the London production. We speak to Bob Grace who was Bowie's music publisher, record producer Ken Scott, studio engineer Ray Staff, and we hear from Mike Garson, who played the piano in Bowie's live performances, and he played the song over 200 times live. We also hear from Mick Rock who filmed the video for the song, from singer Dana Gillespie, friend of Bowie - Wendy Kirkby, Music Publisher Geoff Heath, Bowie biographer Kevin Cann and author Nicholas Pegg. Presenter/Writer Martin Kemp, and co-producer Tris Penna. This is a Sue Clark Production for BBC Radio 2. If you missed the show, you can catch up via the BBC iPlayer HERE. Released today is DAVID BOWIE's 'No Plan' EP and brand new promotional video created by Tom Hingston. DAVID BOWIE inspired and challenged his musicians. But what did they think of him? Here, some of the star's longest-serving players get together over a meal to discuss their old boss in an exclusive companion film to BBC Two's 90-minute documentary David Bowie: The Last Five Years, which marks the anniversary of Bowie's passing. Reminder: As if you need reminding! Tomorrow night sees the broadcast of the new DAVID BOWIE: THE LAST FIVE YEARS documentary by Francis Whately. This one-and-half-hour long programme is showing on BBC TWO in UK at 21.00 - 22.30 GMT. In Italy, the documentary airs on VH1 (channel 67) on Tuesday 10th January. 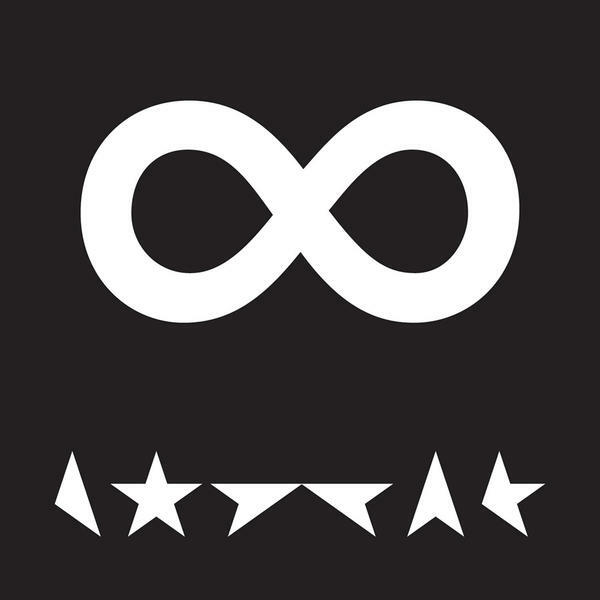 DAVID BOWIE's ★ ends the year as the sixth biggest album, with total chart sales amounting to 410,000. 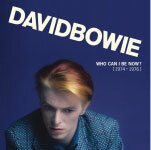 David's final studio album was the fastest-selling of 2016, achieving 146,168 chart sales in its first week of release during the aftermath of his shocking death. 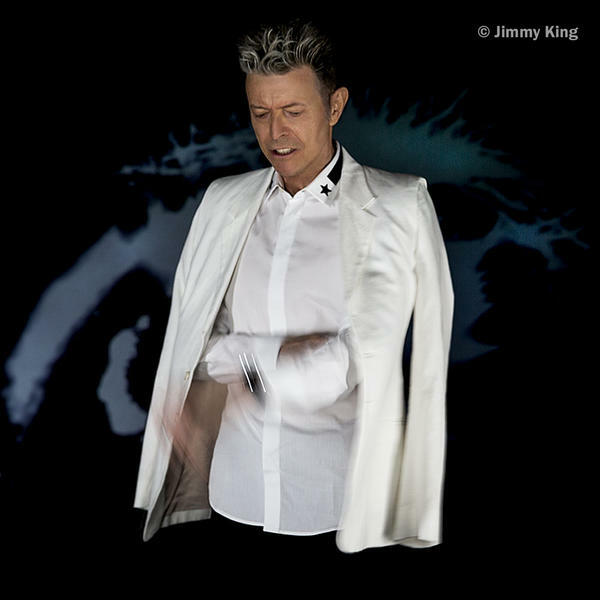 In addition to ★ David's 'Best of Bowie' greatest hits is at 10 with 328,500 chart sales across all formats, while his 'Nothing Has Changed' compilation ranks at 37. You can read the whole article over at the officialcharts.com website. Check out the latest official album chart placings around the world in the BW Specail Features section. ★ was awarded HDU for the best-selling foreign album in Croatia in 2016. The award was presented to the Director Menart, Branko Komljenovic, on the night before Christmas parties ZAPRAF and HDU's. On that occasion, presented the annual awards HDU for the most successful musical works of the previous period. In addition to winning the best-selling album, David Bowie topped the annual list of the best albums released this year. davidbowie.com have announced details of the next DAVID BOWIE 40th Anniversary 7 inch picture disc single to be released next month. For more details and information visit davidbowie.com website. davidbowie.com have announced there is to be another limited edition release specifically for the DAVID BOWIE IS exhibition opening next week in Tokyo. Made in Japan, (Cat. no. SCJ7 1) will feature ★ (album version) and b-side: 'Lazarus' (radio edit) and 'I Can't Give Everything Away' (radio edit). More details over at davidbowie.com website. 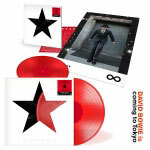 Also to celebrate the visit of the exhibition to Japan, Sony Records International are to release several limited edition coloured vinyl albums on 11th January. No word yet on whether these releases, including the MICK RONSON 'Heaven And Hull' CD Blu-spec CD2 (SICP-31037) released 21st December via Legacy Recordings will be available via cdjapan.co.jp website. 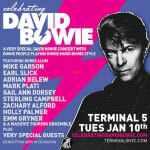 The New York date of the CELEBRATING DAVID BOWIE five-city worldwide tour takes place on Tuesday 10th January at Terminal 5, 610 West 56th Street, New York, NY 10019. Performers include: Mike Garson, Earl Slick, Adrian Belew, Mark Plati, Gail Ann Dorsey, Sterling Campbell, Zachary Alford, Holly Palmer, Emm Gryner and a massive touring ensemble, plus very special guests. General tickets are now on on sale. Don't Hurt Yourself - Beyonce Featuring Jack White. Undercurrent - Shani Gandhi & Gary Paczosa, engineers; Paul Blakemore, mastering engineer (Sarah Jarosz). Update: ALL NOW SOLD OUT. Thanks to everyone who ordered. It's turned out to be more popular than they thought. Announcing a new 48-page DAVID BOWIE fanzine made by fans for fans. A 'vintage' style fanzine, not available online! An A4 colour fanzine, it has molecules! Graphic design by Milky Cereal (@LoveMilkyCereal). Content by @DavidBowieGlamour and @QuietSeclusion. Cover artwork by Helen Green (@HelenGreen). Fan stories, fan art, fan articles, fan reviews, fan photos, fan poems, fan opinion, fan interviews! All inside the NEW DAVID BOWIE: GLAMOUR fanzine. Price £10 plus the postage cost to wherever you are in the world! This is a non-profit making venture. 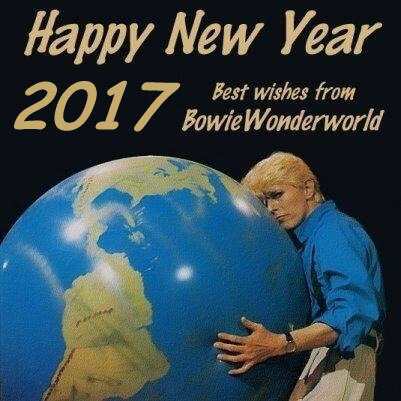 We simply want to share Bowie fans contributions far and wide. 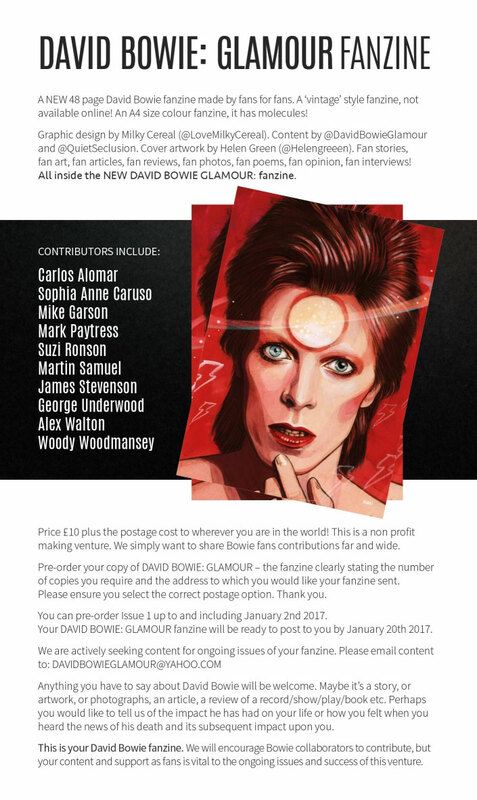 Pre-order your copy of DAVID BOWIE: GLAMOUR - the fanzine clearly stating the number of copies you require and the address where you would like your fanzine sent. Please ensure you select the correct postage option. Anything you have to say about David Bowie will be welcome. Maybe it's a story, or artwork, or photographs, an article, a review of a record/show/play/book etc. Perhaps you would like to tell us of the impact he has had on your life or how you felt when you heard the news of his passing and its subsequent impact upon you. This is your David Bowie fanzine. We will encourage Bowie collaborators to contribute, but your content and support as fans is vital for future issues and the success of this venture. Next 40th Anniversary Picture Disc 7 Inch Single SOUND AND VISION is released 10th February via Parlophone - you can pre-order NOW. 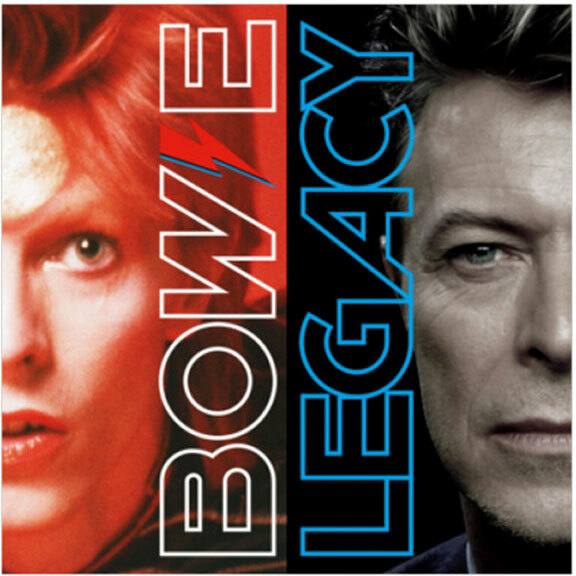 New compilation album DAVID BOWIE - LEGACY released on 11th November via Parlophone in the following formats: CD and 2-CD Deluxe and MP3 digital - the double 2-LP Vinyl edition released on 7th January.